Measurements: 3.35 x 5.15 inches, or 85 x 131 mm. Back of card: Shades of blue. A dark blue border with stars (.6 inches, or 14 mm) frames two circles, one inside the other. The inner circle has a figure eight turned on its side representing infinity (I know the proper name of this but am unable to spell it at the moment). In the outer circle are 8 spokes, the cardinal ones topped with crosses. Wavy lines radiate from the outer circle to the edge of the blue border. May be inverted. Book included: Yes, 160 pages, 3.5 x 5.45 inches, or 90 x 139 mm. On the cover, the Two of Cups, on the back, The World (both in color). Inside, there are few illustrations. Jackson says this proves the Greco-Roman origin of the major arcana but he presents no evidence to support the theory. Further, he makes no effort to ground specific cards into this diagram, which he could have easily done by simply adding part or all of the diagram to key cards. Nevermind that neither tarot images nor tarot symbolism have ever been found in Greco-Roman artifacts, of which there are many surviving fragments. The only place he seems to relates the Tetraktys to the tarot is in a suggested reading spread, called the Pythagorean Method. He retells the usual story how ancient tarot was transmitted to Renaissance Italy. He puts some new wrinkles to it: The ancient Pythagorean number series was preserved by various Guilds (based mostly in Germanic northern Europe) which eventually turned up in the first northern Italian tarot decks. In the process he makes the usual mistakes: First, equating tarot cards with ordinary playing cards. Second, presuming the major arcana to be older than the minor arcana. Third, presuming the ancient tarot needed some ancient secret society to transmit itself - by secret means - to a deserving future. The facts are different. Playing cards (eg, the minor arcana) are much older than the major arcana. Evidence is overwhelming: Edicts banning card playing (by either state or religious authorities) go back to the dawn of history. 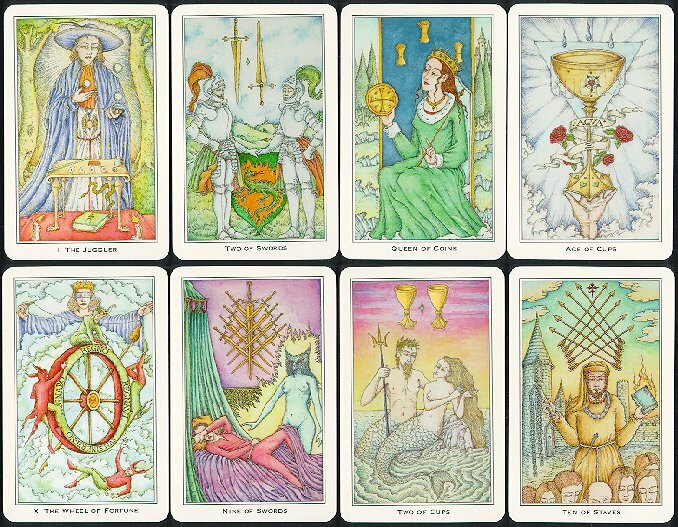 Known tarot decks (meaning major arcana cards), by contrast, date only to the 15th century, in Milan or Bologna. From the earliest known tarot decks to the present (some six centuries), the minor arcana has not changed by as much as a single card. The major arcana, by contrast, has still not been entirely fixed. Nigel Jackson himself sees fit to change the major arcana when it suits him, but does not touch the fundamental structure of the minors. Codify the secrets in some sort of socially enticing form & release them to the world. You will think I am crazy if I tell you of some of the successful examples: The alphabet, its order & design. Numbers (Arabic more than Roman). Perhaps chess & checkers & the 64 square playing board. Ten dots in a triagle. Abracadabra. Pi. The minor arcana playing cards. Are there more? Certainly, but as they are very, very obvious, they are very, very hard to find. But what gives Jackson away as just another one of the modern tarot dabblers are his notes on the cards themselves. The Fool is built into a great all-knowing god. But the Fool is just that: A fool. In the tarot decks I've seen, this was best shown in Tarot Erotica: Adam & Eve, walking blindly over a cliff, out for a Fall. The Fool is nothing more than idiotic potential at its rawest. The Magician is described as a trickster. A.E. Waite, himself a magician, hinted in his Rider deck that the Magician was Jesus Christ, who was in fact a magician of a high order. But this is too much for small minds. They have substituted a trickster, a tempter. Logically speaking, that person should be none other than the Christian devil, already represented in tarot. Go read Faust if you want more. Arcana No. 2, usually the High Priestess, is here renamed the Popesse, specifically Pope Joan. Legend has it that a woman, disguised as a man, rose through the Church hierarchy until she eventually became one of the Pope Johns, somewhere in the middle ages. Unfortunately, Pope Joan, like all other popes before & after, sat in Peter's Chair & because of some rather sly reasons having to do with word gender in the Romance languages, her flesh nullified her as a pope (or as a priest, for that matter). Jackson's Popesse card is otherwise devoid of any of the traditional High Priestess symbols. The substitution of Popesse for Priestess is merely lame. Arcana No. 12, the Hanged Man. According to Jackson, the Hanged Man has traditionally been associated with Judas Iscariot. I don't know where he found that tradition. The Hanged Man is traditionally the symbol of serenity under duress. Judas Iscariot was infuriated that Jesus refused to be the leader that Judas (and many others) wanted. After Jesus threw the money changers out of the temple, Judas was convinced that if challenged, Jesus would act to save his own skin. (After he threw the money changers out of the temple, the local high priests knew they had a problem on their hands.) And so Judas betrayed him. Judas was horrified how things turned out (the unexpected execution of his friend & master) & promptly hung himself - by the neck, not the ankle - in a pitiful act of shame & remorse. In that act he set himself apart from Peter, who three times that same night renounced Jesus. As they say in the Church, Blessed are the cowards! When I write notes on tarot decks, I am first inspired by the cards themselves. But when that's not enough, I look at the book or booklet that comes with the cards. I didn't read every word of Jackson's little book, but what I did read was consistent. Apologies to Nigel Jackson.